Avatars, Profile Pics, and Gravatars! Oh, my! Challenge #4 for the Teacher Challenge supported by Edublogs, asks us to create a new avatar and explain the avatars that we use. Avatars are the representation of yourself in the cyber world. You might choose your avatar to be a cartoon representation of yourself (like the one to the left made at Portrait Illustration Maker) or a photograph of yourself. I try to represent myself online using the same image on all of the sites I visit. 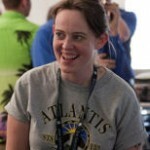 (I also change my avatar image every couple of years, so I am sure I tend to miss one or two in the update.) However, I do have a different avatar that I use for Twitter. I am a big fan of using an actual photograph for my avatars as well. Whatever you choose, try to find an image that really represents you. The current avatars I am using (for blogs and Twitter), feature experiences from the launch of Atlantis I attended in May of 2010. 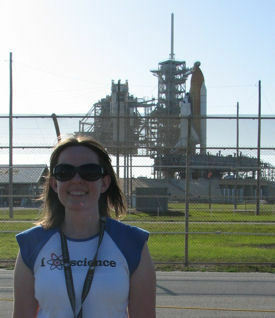 In my Twitter photo, I am wearing the “I love science” shirt I love while standing in front of the launch pad. 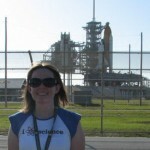 My default avatar for blogs is from the day of the launch, and I really think you can tell how much fun I was having. 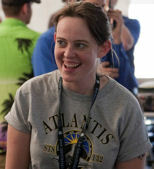 I hope my passion and love for science (and space especially) really shine through in these photos. Have you ever left a comment on a blog site and noticed a funny icon image of an abstract shape or “monster”? Sites like WordPress use a service called Gravatar (Global Recognized Avatar) in order to pull avatar images. If you do not have a Gravatar account, you can visit the site and set up a profile. That way, any site that uses Gravatar to pull avatar images (like WordPress) will display your default avatar image. You probably recognize my default Gravatar image. It is the avatar I use the most often to represent myself online. It is my blog avatar, and it should be what you see when I leave comments. I also use this avatar for my Google profile. The majority of my students are 11-12 years old. Because of their ages, I do not allow them to use photographs of themselves as avatars. Because of this, as well as not having profile images set up correctly when they were setting up their blogs this year, most of my students do not use avatars for their blogs. At this point in the school year, I do not think I will change that. However, I plan to encourage my students to create a cartoon based avatar for our blogs next year. 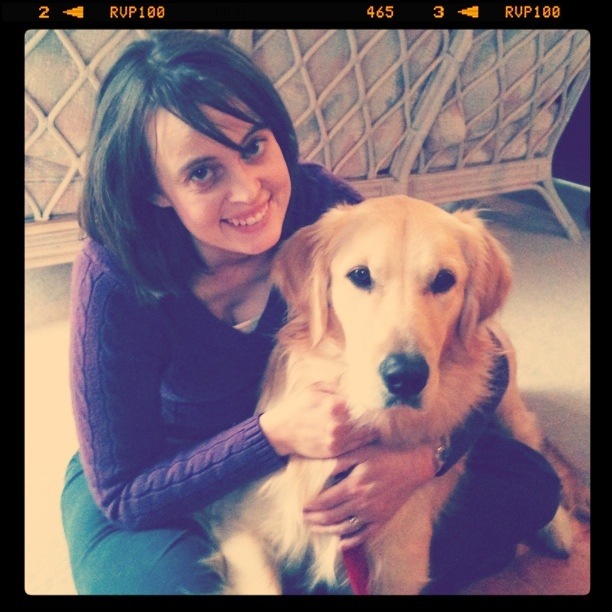 I am curious, when you first saw my avatar image, what did you think it represented about me as a person? Thanks for explaining about “Gravatars” Janelle! I have managed to set one up now, so hopefully my image will appear on more websites now, instead of little monsters and ghosts. I just had an idea for students to create a ‘scientist’ avatar, as well as their own cartoon one – it is always interesting to challenge the assumption that scientists are grey and crazy-haired old men with white coats and coloured chemicals! Thanks, Britt. I love the idea of students creating a scientist avatar. That is such a great idea. I had my students draw scientists are the first day of school, but I might have them make scientist avatars and them personal avatars on the same day. Hey Janelle, Great post. I love how you try and put the ‘real’ you into the avatar. Thanks for sharing about the gravatar as a lot of people do not know about this or how to add it. How did you get that “About the Author” to come up under your post. I really like that and would love to have that too. Have you paid to get your own site or what blog platform do you use? Thanks for sharing all this great information. The “About the Author” information is part of the code in the theme I am using. I do pay to host my site, and I use WordPress to power my blog. That really opens up a lot of theme options for me. I also use it with my main class site and to run my students’ blogs. I’m going to try to write a post later tonight about how my site is set up since I have had a lot of questions regarding self hosting, domain names, etc. Fabulous post, I like how you explained each avatar and where and why you use them. It was a great idea to explain about gravatars. I had done that ages ago and had forgotten how to explain that to people. So delighted with the refreshing of the brain cells. When I see your avatar I see energy and a joy in life. Thanks, Kathryn! I’m glad I was able to refresh your memory on gravatars. I’m going to go check out your post now. Thanks for sharing the link! Like Murcha I would be interested to know what platform you are using. The comment was so easy to post. The same cannot be said for Blogger! I use WordPress. I am definitely going to write a more detailed post about how my web site is set up. Thanks for your great post although I am still not ready to use a photograph of myself – too many years of wanting to only be on the other side of the camera. Instead I choose to use something I have created. Your explanation of Gravatar gave me a good insight as to how it could be very useful. I totally understand not wanting to use a photo of yourself. You definitely need to do what is comfortable. Your avatar is really cute. Thanks for sharing! I love how your avatar shows your passion for science. I did something similar when I set up my blog avatar as a picture of me inside a book–appropriate for a language arts teacher. I did not know about the gravatars. I can’t wait to set one up so I can have a more consistent online image. My 8th graders love the concept of avatars, but I haven’t taken time to teach them. I’m excited to write a blog post that will share the information with them and give them lots of options for doing it. Of course, some of them know more about it than I do. Kay, your book avatar is so cool. I checked out your post, and I really like the new, improved one, too. I think I may have to try a voki, too. Keep snowing so I have time to play! That’s true – I did have a lot of time to play last week with my snow days. I am glad to be back to school this week, though. Hi Janelle, Thanks for your informative post. I will be checking Gravatar out today. Gee I’ve spent so much time on this activity, learning and having fun. Thanks, Glenda. I’m glad you are having fun with all of the avatar info that’s being shared. I have found some great sites from other bloggers’ posts. Thanks for popping by my post Avatar – see me, leaving a comment and a crumb trail to your fabulous post. I’m turning your final question around by saying: “I did not expect this picture when I saw the name MrsJWilson” – and this adds gravitas to all that’s been said about avatars. Hi, Malyn. Thanks for stopping by! Good point. I usually use “janellewilson” as my username around the web unless I am working with students. With students, I use “mrsjwilson”. I initially had a more “formal” avatar to use with students, but they all know how passionate I am about space, and I’m pretty laid back, so it didn’t really mesh well with my classroom. Liked the clear explanation about gravatars. To me, your avatar projects friendliness and enthusiasm for life. thanks for the info on gravatars- I need to find out more. I didn’t know you could use photos. I also need to think about not letting kids use photos of themselves. Thanks for stopping by, Nancy. Sorry I didn’t respond sooner; my filter decided your comment was spam for some reason. I think all of your avatars emphasize your smile; I think everyone around enjoys being with you. A dog-lover is just that way 🙂 Thanks for the links, and for explaining about Gravatar; many people are new to that. I also like your use of photos to create your avatars; I also think that is important for teachers and others; it makes your blog your word, if you know what I mean. Kids, though, need avatars — show personality and protect privacy. Thanks for all the ideas! Thanks for stopping by, Sheri! I agree that students need to have non-photo based avatars. This year, my students pretty much did not have them at all. If they did have one, it was of something they thought represented themselves without showing a photo of them. Next year, I will be incorporating true avatar creation into our blog set up!